01-16-2019 : Leading barcode software and fonts package introduces barcode creation in Angular and WOFF2. Please follow the steps below to setup the barcode fonts in your Mac OS Fonts directory. This will allow you to used the barcode fonts in other applications easily. Open Finder and click on 'Applications' in 'Places'. Hold down the control key and click on 'ConnectCode Barcode Software'. Select the item 'Show Package Contents'. Browse to the 'Contents -> Resources -> BarcodeFontsSource' directory. 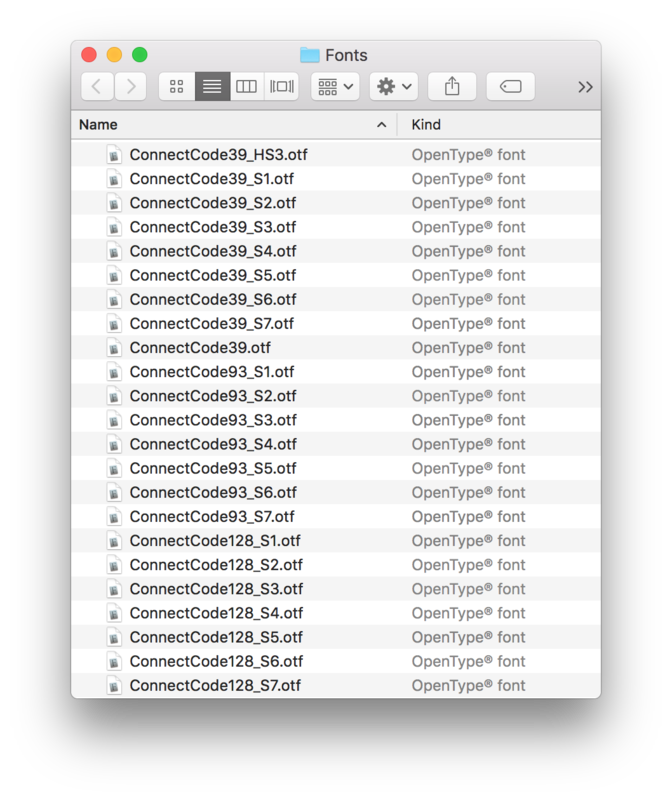 Copy all the files (Open Type fonts) in this directory to your '<username>/Library/Fonts' directory. For OS X Lion users, please note the Library folder is hidden. Simply use the Finder -> Go -> Go To Folder option, enter "~/Library/Fonts" and click on the Go button to access the directory. 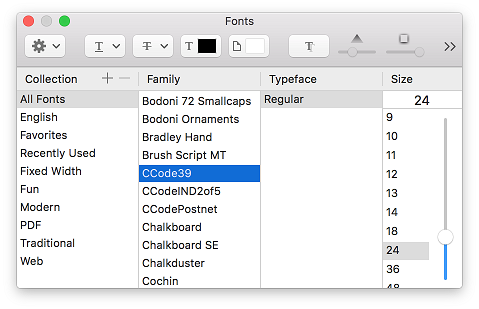 For OS X El Capitan users, you can click on the menu Format->Font->Show Fonts option in TextEdit/Numbers/Pages or other applications to see the barcode fonts (All Fonts->"CCode...") available. Back to Barcode Software for Mac page.